Wow, have you packed a punch here. 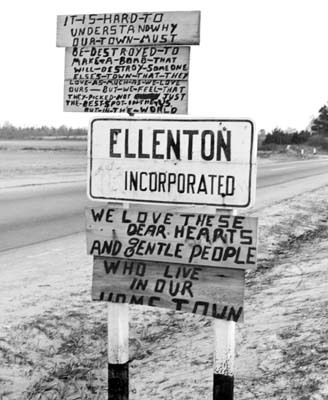 I’ve thought about Ellenton, and also the folks who lived where Lake Murray now is. I think about the fact that they could no longer visit the graves of family members, or be buried alongside them. The idea of not being able to pick a pear from the tree grandpa planted out back is especially poignant. I moved every couple of years as a kid because my father was an engineer. It provided me with a great education and a great view of different parts of the country and the people who inhabit it. It also left me with a void that continues to this day in terms of friendships. I vowed that my children would not be uprooted, that, if I could help it, they would have single place to call home. And it wouldn’t be an Atlanta or Los Angeles or Boston, but a place where they could enjoy the country, swimming in rivers, being able to see nature first hand and interact with friendly folk of all sort. I may not be a native in the true sense of the word, but I consider South Carolina home because it offers me all the things I longed for for so long. Thanks so much for your stirring words. I couldn’t agree more.